« Will NH’s Fiscal System Get Better Looking Each Year? Don’t Just Honor Them, Hire Them! Today we honor veterans, at least that’s the idea if we can find the time between trips to the mall. I hope you read about or listen to their stories today. If you happen to come by this blog, on this important day, here is one important story. The unemployment rate among those who have served on active military duty is higher than it is for those who have not served, at all levels of educational attainment. I am no expert on why, but I know it is no way to thank men and women for their service. 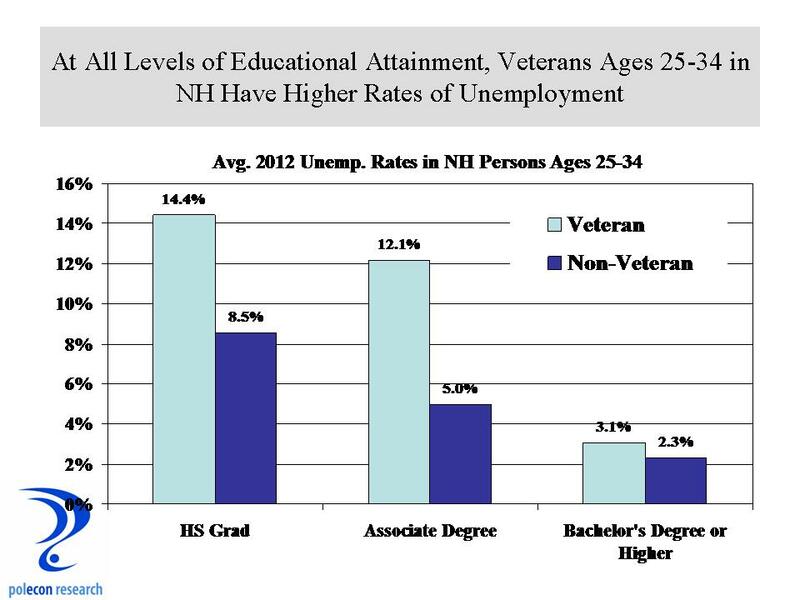 Below is a chart that shows the unemployment rate among 25-34 year olds in New Hampshire, by educational attainment and whether or not they ever served on active military duty. So honor them today for sure, but hire them tomorrow if you can. This entry was posted on November 12, 2012 at 12:10 pm and is filed under Education, Educational Attainment, Unemployment. You can subscribe via RSS 2.0 feed to this post's comments. I second the idea — let’s honor Veterans by helping them find good jobs.